The origin of this recipe is fairly humble: Hubby was hungry for steak and I was not, so I stuffed some large button mushrooms full of leftover spicey red rice and topped them with Monterrey Jack cheese and baked them. They were so good, I ate way too much...the rest of them I re-heated (microwave) for lunch the next day and they were excellent. 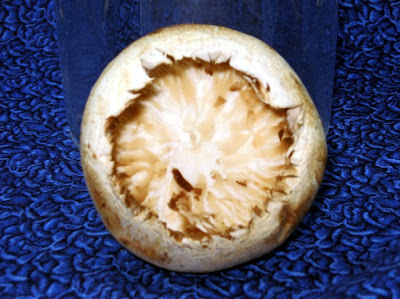 I used a melon baller to scrape out the gills of the large mushrooms which made a nice pocket for the rice. I stuffed the raw mushrooms full of (cold) red rice. 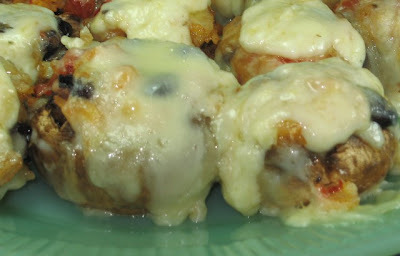 Place the stuffed mushrooms in a 9 x 13 baking dish and top with shredded Monterrey Jack cheese. Heat the canola oil, then add the raw rice, onion and spices. Saute this mixture until the onion is transparent and the rice is opaque. Add the red bell pepper, kidney beans, the whole can of diced tomatoes (plus the juice) plus 1 full can of water and another 1/2 cup of water and the mild green chili's. Stir well and bring to a boil, stir well, put tight fitting lid on the pan and turn the heat down to a low simmer. Cook for 20 minutes (don't lift the lid), then turn off heat and let sit for 5 minutes. Fill the prepared mushroom caps with the rice mixture and top with cheese. Bake in pre-heated 350 oven for 15 minutes then turn on the broiler for a minute or two (to get some color on the cheese) and serve. you go easy on the cheese. Oh, I like this stuffing! They look pretty addicting :) Yummy. That cheese looks so ooey gooey delicious! As usual Coleen, these look delicious! 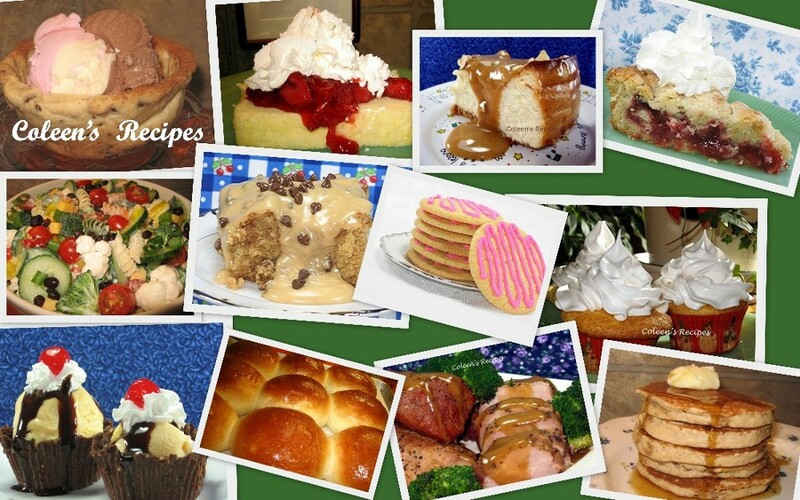 Oh, boy those look terrific! We LOVE mushrooms especially the (all three) kids. I'm loving the look of these...so elegant and delicious! YUM! I love all that cheese oozing over top! I came to the right place today. These look yummy and I always look for new ways to use mushrooms. I love the cheese. You just reminded me that I have a basket of mushrooms that need to be used. 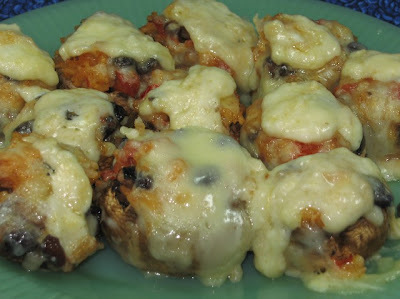 What a great idea to stuff them with rice & beans and top with cheese. I am hungry now. I would have never in a million years thought to stuff mushrooms this way! WAAAYYYYY too good! Great idea, i could probably eat about twenty of those! 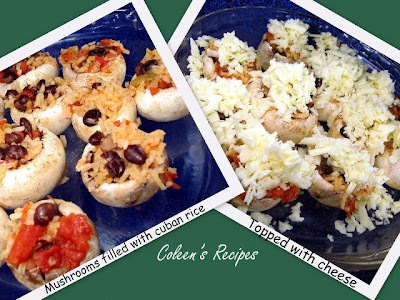 I love stuffed mushrooms for a side dish, an appetizer or a main course. These look great especially with all that cheese! Coleen, these look good. Boy would we enjoy these on one of our movie nights. Nifty little food while we are discussion "who done it!" Whoa! These looks delicious! What a great idea for stuffing.